British director Asif Kapadia made his feature debut in 2001 with the stunningly confident The Warrior, an epic, mystical tale of redemption set in the Indian desert, which received a rapturous response from the critics. Despite this initial success, it took Kapadia seven years to get his second feature made and distributed, but the film is certainly worth the wait. Based on a short story by Sara Maitland, Far North focuses on two women living in the Arctic Circle, isolated from all until one day they rescue a stranger. Harsh and beautiful in equal measures, Far North confirms Kapadia’s unique talent and is one of the unmissable films of the festive season. Virginie Sélavy interviewed Asif Kapadia at the London Film Festival, where the film premiered last year. 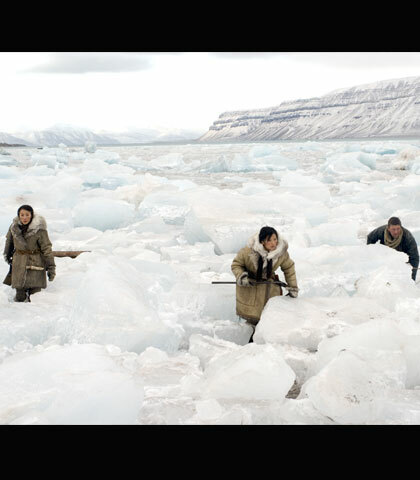 Virginie Sélavy: Just like The Warrior, Far North is set in an inhospitable, spectacular wilderness. It seems that for you the location is just as important as the story or the characters. Asif Kapadia: First, I find a story that I like and with both films, The Warrior and Far North, the stories were linked to a place. The Warrior was always a type of Western for me, which meant shooting in the desert, with horses and all that, and that led to shooting in India. Far North came from reading a short story that my co-writer Tim Miller had given me, by an English feminist writer called Sara Maitland. It’s a very short short story, only six pages long, and the idea is that two women, one older woman and one younger, live on the ice in the middle of nowhere, surviving off whatever they can kill – it’s a pretty extreme location. On the ice, they meet this injured soldier, they take him in, and this sort of triangle forms between the three of them. So the inhospitable place was part of the narrative from the beginning. VS: The images of the frozen landscape are breathtaking but the point is not just about how beautiful nature is, it’s as much about how hostile and awe-inspiring it is and how small man is in the middle of it all. AK: Absolutely. That was a very important part of the story. It was crucial for me to show how dark and extreme and dangerous this place is, and it’s what drives Saiva (Michelle Yeoh) to do what she does. It’s out of desperation that people do desperate things. In a place like that, any food you get is so vital. If they find a seal and they kill it, they’ve got food, they get clothing, you use all the bones to make all of your tools – survival is everything. That was one of the reasons why I wanted to film somewhere where you really believe that it’s all about survival. Inherently that was what the short story was about. VS:There seems to have been a shift in how you see nature from The Warrior to Far North. In The Warrior, nature is serene and majestic and it’s a counterpoint to the violence of men, whereas here the violence of men is very much integrated into the violence of nature. AK: In a way, this is like yin and yang, an inverse to the story of The Warrior, which is this journey of redemption where, no matter where you come from, there is hope that you can always change. In Far North, the journey of the character is a very dark one. The Warrior was an Eastern, more spiritual film; it was warmer. In Far North, it’s the opposite; it’s hard, it’s dangerous. I got left behind by one of the guys I was following in the middle of the darkness when there could have been a polar bear anywhere on this island. Those polar bears are so fast and so dangerous, no one would ever find your body. And you really sense that when you’re there. When you’re looking up at one of these huge glaciers it’s beautiful, but you know that a huge chunk of ice could collapse at any moment, and if you’re on a boat in front of it it’ll form a huge tidal wave. I wanted to get across this element of tension that’s in the air in a place like that. And the tension is also about who you can trust. Generally, over there you can’t trust anyone, whether they’re trying to sell you animals, or whether they’re going to try to kill you or steal your food or your clothing. That is something that is inherent in this world and it was very important to convey that. So in my mind the two films work together. What we’d like to do with my co-writer is to try to make a quartet of films, a film in the East, that’s The Warrior, this is the film in the North, and next we’ll do a film in the South, maybe in Latin America, and then maybe a western. They’re four different kinds of morality tales dealing with people within their landscape. Read the rest of the interview in our winter print issue, which is explores celluloid snow with articles on Werner Herzog’s Encounters at the End of the World, Aki Kaurismäki’s Calamari Union, John Carpenter’s The Thing, Christmas slasher movies and cult Japanese revenge tale Lady Snowblood. You can buy the current issue online, order back issues, or subscribe to the magazine at Wallflower Press. Subscription is Ã‚Â£12 UK or Ã‚Â£15 overseas for four issues of Electric Sheep (incl. P&P) – buy online from Wallflower Press and get a 15% discount! For gift subscriptions please email Wallflower Press.